Road No. 4, Old DOHS Banani, Dhaka, Banglades, 06/11/2007. © Kauser BHUIYAN. All rights reserved. 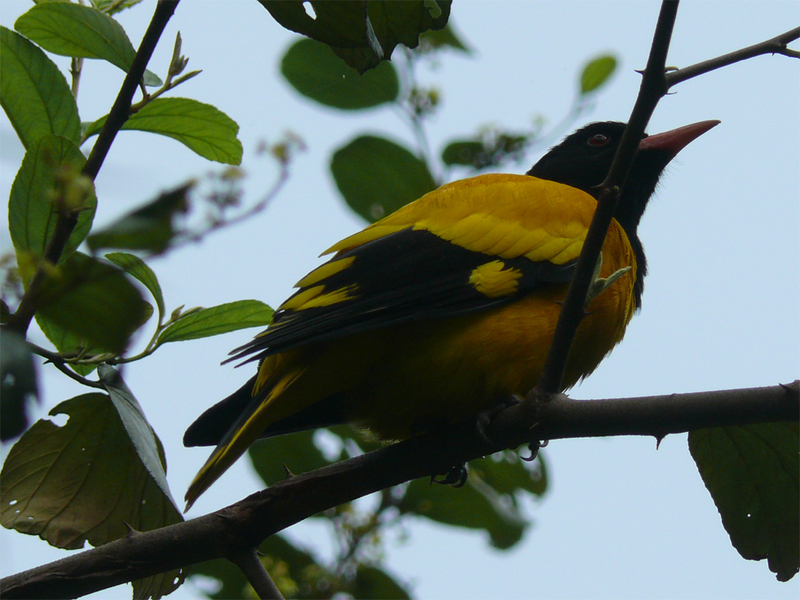 The Black-hooded Oriole (Oriolus xanthornus) is a member of the oriole family of passerine birds and is a resident breeder in tropical southern Asia from Bangladesh, India and Sri Lanka east to Indonesia. It is a bird of open woodland and cultivation. The nest is built in a tree, and contains two eggs. The food is insects and fruit, especially figs, found in the tree canopies where the orioles spend much of their time. The black head of this species is an obvious distinction from Golden Oriole, Oriolus oriolus, which is a summer visitor to northern India. Orioles can be shy, and even the male may be difficult to see in the dappled yellow and green leaves of the canopy. The Black-hooded Oriole’s flight is somewhat like a thrush, strong and direct with some shallow dips over longer distances.